Weather Sealing is protection of the internal parts of a camera from external influences such as moisture, dust, and humidity. The degree of this weather sealing varies between manufacturers and also within models by each manufacturer. The protection is provided by both rubber sealing with silicon rings and gaskets as well as design considerations such as interlocking panels and pool resistant exterior pieces. Most obviously buttons such as the shutter release will be designed with either a rubber housing beneath them, or a gasket to prevent the entry of the elements. Sealing is not provided by a single piece of hardware. I have often seen values such as 60-70 silicon rings being used in a typical DSLR body for weather sealing, and 30-40 being used in a battery grip for example. Weather sealing in all but the most high end professional serious cameras is a relatively new occurrence in the consumer market. 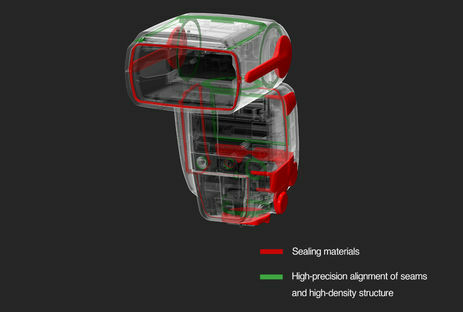 One can now commonly find weather sealing even in cameras costing under $1,000 USD if you look for the right models. Commonly weather sealing considerations are limited to moisture from weather such as rain, snow, humidity, and also dust and sand. I would argue that weather sealing does not end at that, but also includes anything that protects the camera from usage and keeps it working as designed. With this in mind I would also consider features such as magnesium-alloy chassis design, shock protection, shielding against electromagnetic interference, stronger shutter mechanisms, sensor dust resistance, carbon-fiber lip on lens ends, and even special fluorine coatings on the low-pass filters as all being components of weather sealing. The seals and gaskets highlighted in this image of a Canon 7D is what is considered the weather sealing. You hinted at another good point which is how lenses play into the weather sealing equation. A camera body can be weather sealed, but if you add in a lens that is not, that in essence will compromise the integrity of the body weather sealing. Water could enter through the mount in these cases, and the gaskets and rings in the body design will not prevent this. With this in mind, to complete the weather sealing package you will want to look for a lens that is weather sealed as well. Some lenses(not all) require the addition of a front filter element to complete the weather sealing. Keep this in mind when purchasing weather sealed lenses and read the specifications to ensure you are equipping yourself properly. 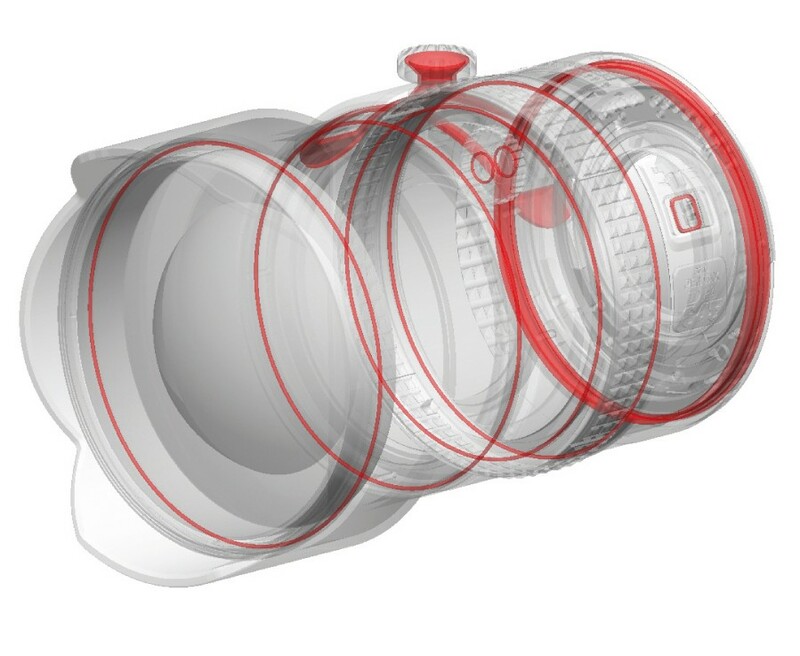 Chuck Westfall, Advisor for Technical Information at Canon USA states that, “Canon EF lenses that have been enhanced with countermeasures for dust and water resistance are typically equipped with rubber gaskets and seals at key points. "I’ve never been very impressed by anyone’s weather sealing. A rubber gasket at the lens mount, waterproof tape over the holes under the rubber, that’s about it. I can see that it would tend to keep water droplets from working their way inside the lens but I can’t imagine them surviving a steady rain – watersealed or not. I haven’t noted any difference in Canon, Nikon, or Olympus high end lenses." Weather sealing doesn't end at camera bodies and lenses. Even external flash units can be weather sealed. The Canon Speedlite 600EX-RT for example has quite extensive weather sealing. It has a level of weather sealing that matches the moisture- and dust-resistance of the EOS-1D X camera body. An interesting development as of recently is that some pop up flash units on DSLR's are also now considered weather sealed. Historically this has been a failure point of weather sealing, but some how Pentax has been now offering DSLR's that are weather sealed and also have pop up flashes. Weather sealing does not mean weather proof. It is uncommon for manufacturers to guarantee any performance based on the sealing. If a camera notes that it is weather sealed, you can be more confident using that equipment in inclement weather such as light rain or snow. Some models exhibit fantastic sealing and can be submerged in water for a time and still perform without issues. Other weather sealed models can fail even after a light spray of mist. I would advise caution unless you are certain that the sealing is sufficient in your conditions, and even then a bit of common sense can go a long way. It was mentioned above, but I will mention it again here - if you use a non weather sealed lenses with a weather sealed body, you are risking a failure. The inverse is also true, using a sealed lens on a non sealed body can be troublesome. It is recommended to use a fully sealed kit including body and lenses when the conditions deem weather sealing necessary. Connecting external adapters and or cables can also compromise the sealing. The connection of a USB, HDMI, PC, or other connector can force the opening of a protective cover that would then expose the camera body to external forces. Another issue can be battery grips, that typically require the opening of the battery door to insert the grip. Not all battery grips are weather sealed, and even those that are can negatively impact the weather sealing performance of the camera body. Video of weather sealing on Canon 5D MkIII from Canon(a must see!) - Click on Operation and Construction to expand the secion, you will find the video inside. How weather resistant is the Canon EOS 7D? How do you protect a camera and lens while photographing in rain or snow? How do you protect your camera when taking pictures in inclement weather? 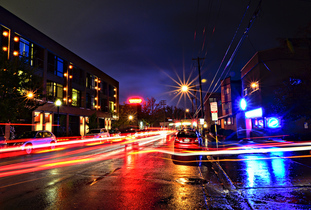 How resistant is the Canon 7D + 50mm f/1.8 II in light rain? 1) A camera is weather sealed if it has - you guessed it, weather seals. Most importantly on buttons and openings but also along the case. The level of weathersealing varies - and it is also weathersealed not waterproof which some people think it is. 2) A non-sealed lens can allow water to enter the camera via the lens but more importantly via the lens mount. I.e. a non-sealed lens breaks a camera's weather sealing. As to it being effective, well, you need to be the judge of that. People have used unsealed cameras in rain before without issues - others experienced a sealed camera failing in bad weather... Weather sealing means your camera is more likely to withstand humidity - it is not a guarantee that it will. Weather sealing generally consists of light o-ring seals around any openings and water/dust resistant sealing on the controls. Weather sealing is only as effective as the weakest link. If the lens isn't weather sealed, then no amount of weather sealing on the body will keep it weather sealed. It will make some difference from direct exposure to rain, but humidity will still enter through the lens mount and through the lens itself. It can also be compromised by battery grips. The amount of compromise caused by a battery grip isn't as bad as that caused by a lens, but it still greatly reduces the weather sealed performance. It is also worth noting that a weather sealed lens will not maintain it's weather sealing if used on a non-weather sealed body as moisture can enter the lens through the opening to the camera. It's also worth noting that some weather sealed lenses are only properly weather sealed when using a screw in filter. Not the answer you're looking for? Browse other questions tagged equipment-protection body weather camera-design weather-sealing or ask your own question. Are “weather sealed” gear tested or rated for their sealing? How weatherproof is an average modern lens? What precautions should I take when taking a camera into humid conditions? Is the Canon 24-105mm f/4 lens weather sealed? How effective are the rear weather sealing rings on lenses?